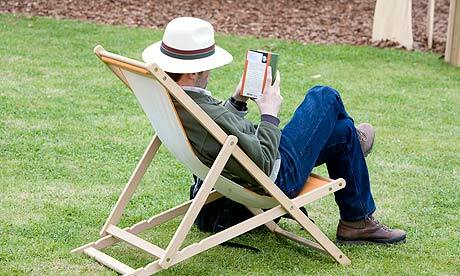 Summertime, and the Reading is Easy — Or Is It? I had a ritual when I was a kid — as soon as school was out for the year, I’d sit down and do an audit of all of the books I’d been collecting throughout the year that I hadn’t had a chance to read because I’d been too busy doing schoolwork. I’d gleefully make a list (index cards were often involved), and revel in imagining all of literary pleasures that were ahead of me for the months ahead. I knew I’d only end up tackling a small percentage of the books on what was usually a very long and ambitious list, but I loved fantasizing about all of the exciting possibilities. Even though I’m now a working adult, every year around Memorial Day I still get that same impulse as I did when I was a child to start planning for summer reading. Summer is a different beast now — there’s no three-month vacation from responsibility — but I still view the warm weather months as my chance to immerse myself in one of my first true loves, reading. And as I browse my Kindle at all the books I’ve downloaded but haven’t yet read (Meg Wolitzer’s The Interestings and Kate Atkinson’s Life After Life are calling to me right now, as are Gillian Flynn’s pre-Gone Girl novels) and peruse my bookshelves for the tomes that have gone unread for months, or in some cases, years, I feel those familiar pangs of possibility. The problem is, if I can even call it that, that I have a life. (Poor me.) I have a good job to go to 40-plus hours a week, an amazing partner to spend time with, great friends to visit with, plays and movies to see, and even television to watch. (Read my post on how there’s so much more new programming on in the summer). So where am I going to find time to read Alice Munro’s short stories, and my recently downloaded versions of The Yellow Birds and The Orphan Master’s Sons, and all the memoirs I’ve been considering diving into? Truth is, I probably won’t. I’ll take advantage of a couple of vacations I’ve got scheduled to do some heavy-duty reading, but beyond that I’ll probably end up reading as much as I do in the winter, spring or fall — on the subway, before bed, or in spare moments here and there. That childhood fantasy of spending every moment with my nose in a book is not going to be a reality. And that’s okay. But it won’t stop me from accessing my inner child — from making my lists and dreaming of what could be. Tell me about your summer reading habits, and what you have on your summer reading lists. I want to know.